Representing the best in the industry through a custom user experience. he Council of Insurance Agents & Brokers (CIAB) is a highly selective organization representing the premier members of the insurance industry. The Council provides high-touch value for members at every opportunity, from promoting industry news to advancing the interest of members and their integral role in mitigating risk for their clients. As an industry leader, CIAB created new internal initiatives that needed to be better represented on the web. To craft a concierge-like experience for target audiences, the new site was designed to provide intrinsic value at every opportunity using Salesforce integrations. WDG’s redesign helped CIAB create an ideal user experience by reorganizing the site structure and improving the information architecture with Swiftype federated search to highlight CIAB’s most valuable initiatives in a clean, modern design. CIAB represents the top members of the insurance industry. Though they have an established user base, it was vital to attract new members as industry demographics continue to shift. As an integral portion of the organization’s networking arm, the massive success of these events provided natural competition points to advance the industry. Therefore, the Events pages needed to be more prominently displayed. 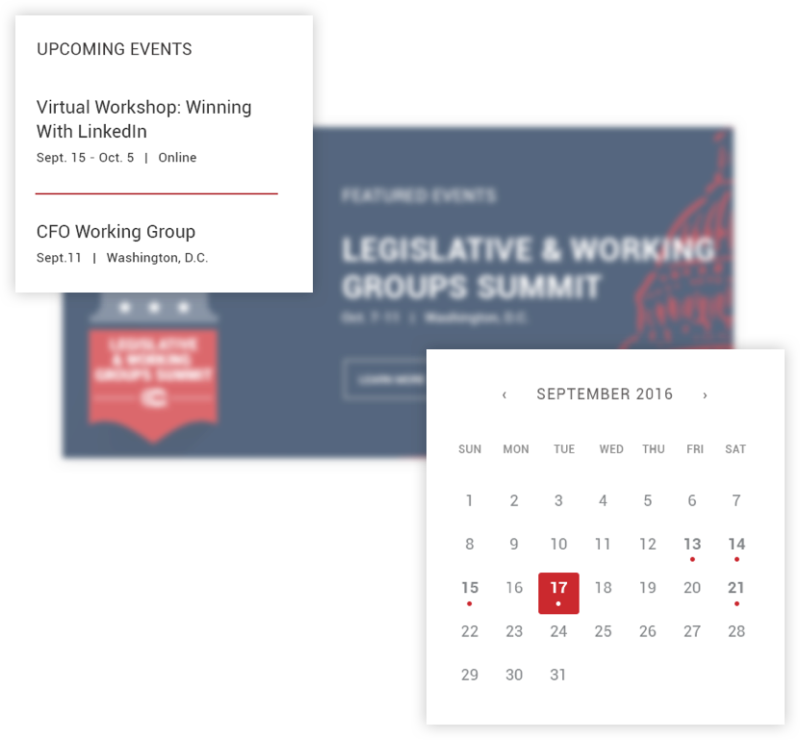 To help reinforce events as selling point in CIAB’s brand, WDG revamped the navigation structure to more effectively and quickly guide users towards the reworked Events pages. 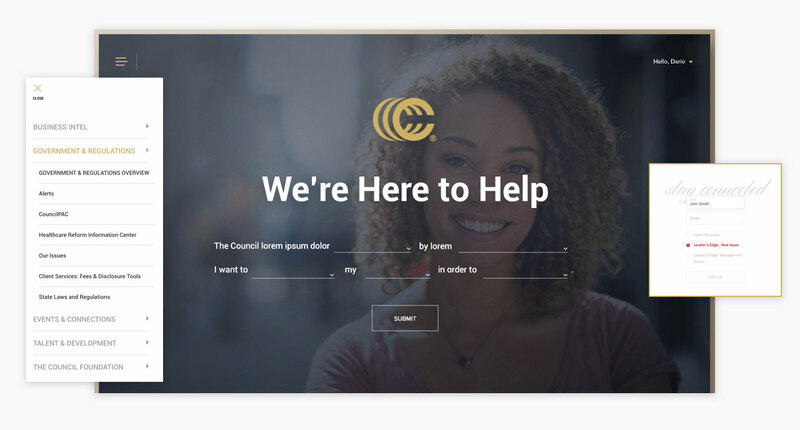 CIAB partnered with WDG to create a more targeted user experience. Specifically, WDG created a streamlined information architecture to help emphasize new internal initiatives. For example, The Council Foundation, the charitable arm of CIAB, focuses on maintaining the top talent within the industry. This section was previously nested within other pages and was extremely difficult to find. WDG created a new site structure which made the page more readily accessible for users and allowed administrators to prominently feature important initiatives in real time. As the industry leader, CIAB represents the ideals of exclusivity, heritage, and recognition. Balancing the prestige of CIAB’s established brand with a modern aesthetic was a particular challenge for WDG designers. A brand exploration exercise was therefore instrumental. After offering different iterations of visual representations, mood boards and a color study exercise with CIAB executives helped WDG’s team finalize the ultimate design. As the brand became more clearly defined, stylized illustrations, clear pagination, font pairings, and button stylings were seamlessly enfolded into the design. Ultimately, our work successfully married the modern magazine entity and the traditional company image into a harmonious design. 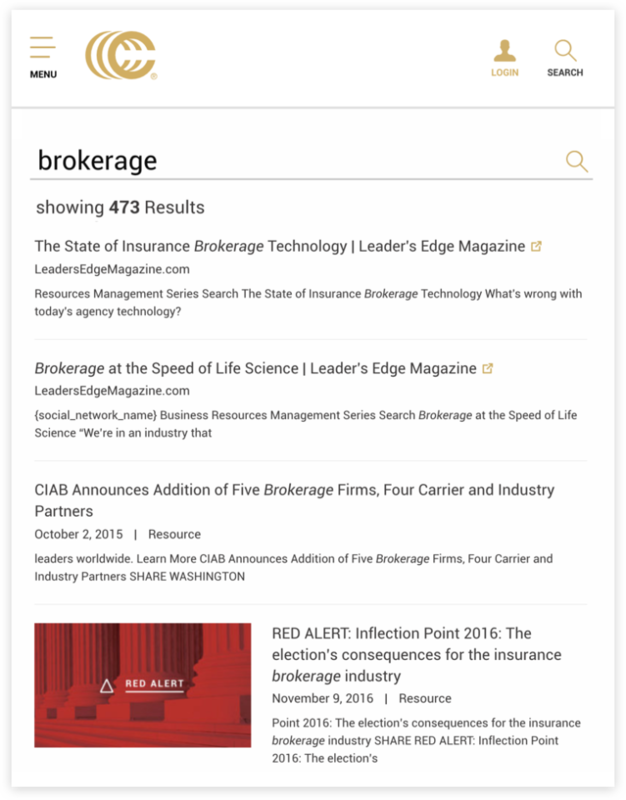 Part of the efforts to improve the site structure for CIAB included a revamped navigation and more accessible taxonomies to better filter content throughout the site for relevancy. WDG also helped migrate the site to Salesforce and created a single sign-on capability through Salesforce. The implementation of flexible layouts on WordPress allowed for greater longevity of the website; it also enable administrators to easily create new pages, present style components, and anchor more experiences on the website before allowing users to jump off to other sections. For example, the “Events” system links through Cvent, so flexible layouts give administrators the ability to create landing pages before jumping off to the events calendar. WDG developers implemented a federated search feature which allows users to search the site with results from more than one domain. We also used Swiftype integrations for weighted searches, enabling admins to more easily set or modify the search weighting and build out features in real time. This integration also gives CIAB the ability to customize keyword search results, including the use of synonyms. For CIAB, our development team integrated an Ouath-based SSO solution with a Salesforce community using the REST API and a Salesforce connected app. We also worked with CIAB’s existing CRM data to import permissions needed by the client to restrict content within WordPress. Some permissions required membership status, while others were based on expiration dates. We also added the restricted content permissions to all content types, including Pages, Resources, and PDF documents. Lastly, we created customizable error messages based on Salesforce permissions. Supporting an environmentally sustainable and socially just society.